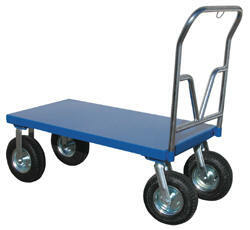 Travel over rough terrain with these steel platform trucks. Ideal for nurseries, farms, and warehouses. Units have 12" x 3-1/2" (2) swivel and (2) rigid casters and a removable chrome plated handle. Durable baked-in blue powder coat finish for added toughness.